Easter is literally tomorrow, so I am going to try and get through the last of my Easter related food items tonight. 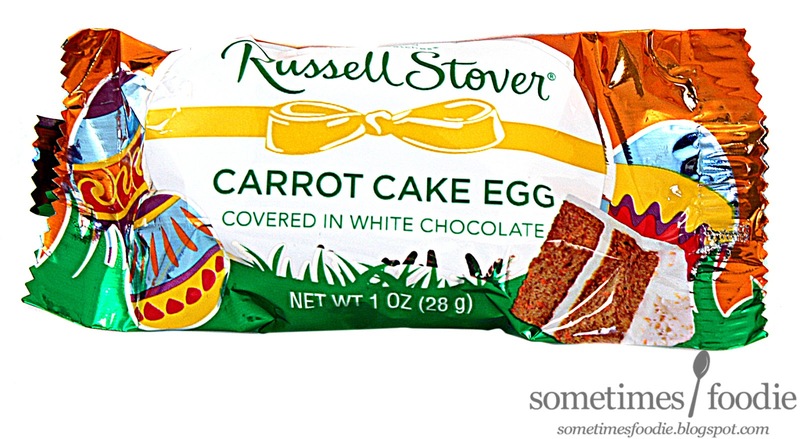 To kick things off, a super short review of this Russel Stover Carrot Cake Egg. These individual egg-shaped candies are a decent size, maybe slightly bigger and heftier than a Reese's peanut butter egg, and the wrapping is decorated with bright colors, seasonal illustrations, and lovely foils. The design looks a bit old fashioned to me, in the not-good kind of way, but I like more modern and simplistic packaging. Traditional Easter celebrating folks must love it, because these are pretty darn popular. The shelves at the local drug stores are lined with these things in all sorts of flavors. I've always seen them around, and to be honest, I'm not much of a fan. Sure, the packaging is nice enough, but it's the quality of the product itself that I'm not so keen on. 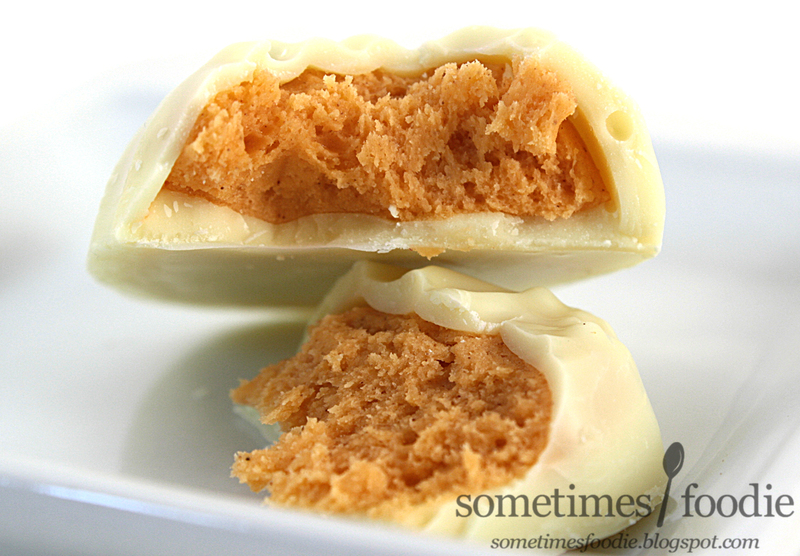 Inside the wrapping is a lovely white chocolate egg with some textured detailing on the top. The presentation is really nice and quite elegant for a individually wrapped drug-store candy, and it smells sweet, milky, and spiced. I took a bite, and man was this thing sweet. The chocolate is sweet enough on it's own, and it's a decent quality melting nicely on the tongue, but when that already super sweet coating mixed with the sugary sweet and slightly grainy filling, it's just way too much for me. The filling has clove and nutmeg-heavy flavor, which reminds me of the Carrot Cake m&m's I'm so fond of, but this is like eating a big handful all at once. I'm the kind of person who eats my sweets one at a time, so this was like a sugary carrot cake punch in the face. 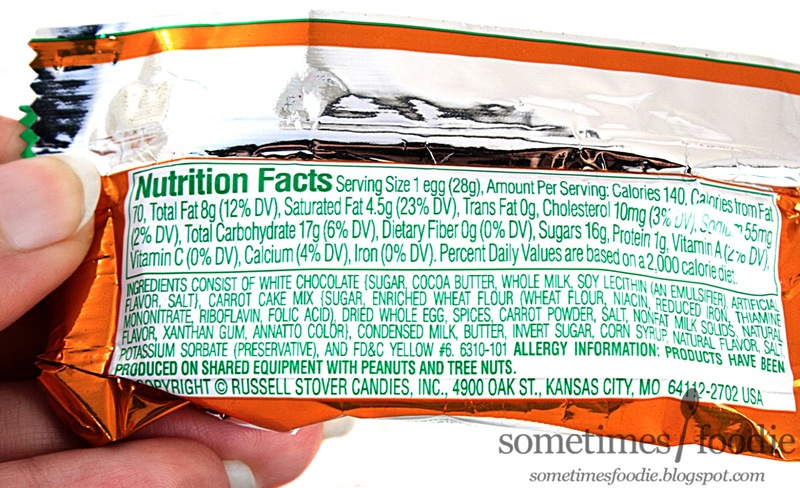 If you really like the carrot cake m&m's, this has a similar flavoring, it's just a lot less easy to portion or and share. It's way too sweet for me, and even though I love that this has a spiced flavor, I won't be repurchasing.